Renaissance is finally available for all to play on Dominion Online! If you missed the preview week or need a reminder for the main new mechanics both in the game and some changes in the online client, take a look at the introduction for the preview week. The full rulebook is available from Rio Grande's website here under Download Game Assets. Let's start with some Renaissance cards that do something new or may not work exactly as you think after cursory reading. The interaction between those 2 cards was the number one bug report during the preview week. Once you've bought Sewers, if you then trash something with Priest and use the Sewers to trash something else, you ought to get the additional +2 coin from the Priest, right? Unfortunately, no . 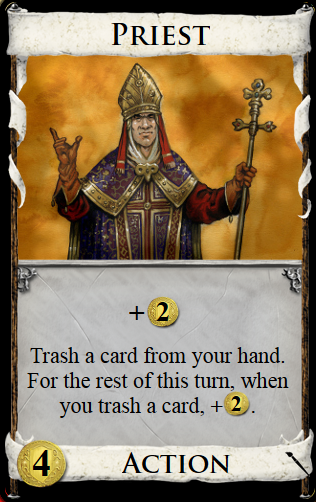 As always, card effects are executed top down, so Priest first gives +2 coin, then trashes a card from your hand. Now Priest stops executing for a moment, because the last effect triggered Sewers. 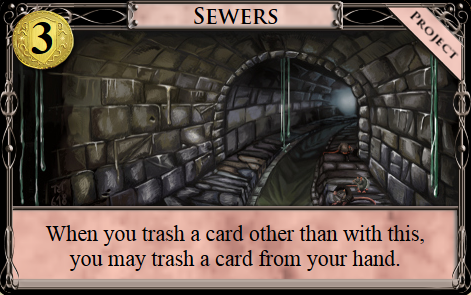 You execute Sewers, and you decide to actually trash another card from your hand. Sewers' effect is over now, so Priest continues executing. Only now will the Priest vow to give you +2 coin for each additional card you trash this turn. Unfortunately, this is too late for the Serwers trash. 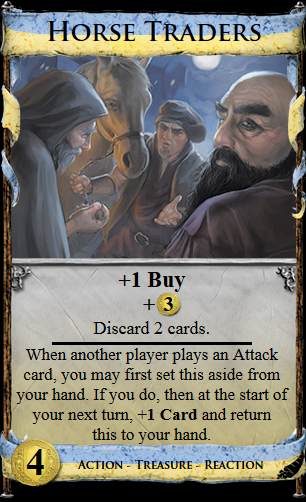 This is the second card (after the Project Innovation ) that allows you to play a card during the Buy phase that you can't normally play then. Unlike Innovation, which (usually) kicks in when you bought an Action card, Scepter acts in the first step of the Buy phase, when you are still playing treasure cards. That means replaying a Smithy or other draw card can be a good idea: Any treasure cards you draw you can still play. In the interface, there will be a button to give you the +2 coin, and all the Action cards in play that are replayable will have a colored border so you can select one of them to play. In case there are no suitable Action cards, another button will be there to allow you to choose the Action path but fail to do anything in it (in very rare circumstances getting the +2 coin might be harmful to your strategy). Yep, you read that right. 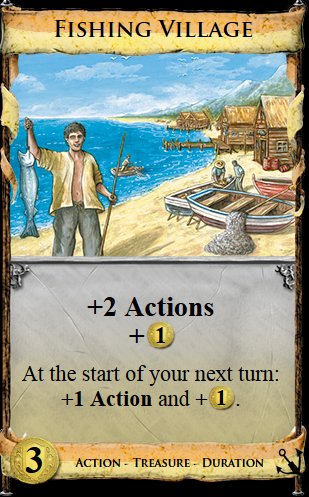 All Militias, Fishing Villages, Horse Traders and (if I counted correctly) 99 other Action cards are now also Treasures on your turn (if you bought Capitalism). Which mostly means they can also be played in the Buy phase, not taking away from your (free or otherwise generated) Action budget! So make sure to play the non-Treasure Actions in your Action phase, end the Action phase, then play the (Action or normal) Treasures in the Buy phase. Be especially careful not to waste Villagers on Action Treasures. The card must have a "+" sign immediately followed by a coin symbol in the text. So cards like Workshop or Remodel that contain coin symbols without "+" aren't affected. Talking about the "+1 coin" Adventure token counts (so Teacher is affected), the "-1 coin" token does not count (so Bridge Troll isn't affected). To make sure you immediately see which cards are affected, a bunch of new card frames were created (thanks Seprix! ), so the shown frame matches what it would be if the card was printed with the treasure type. 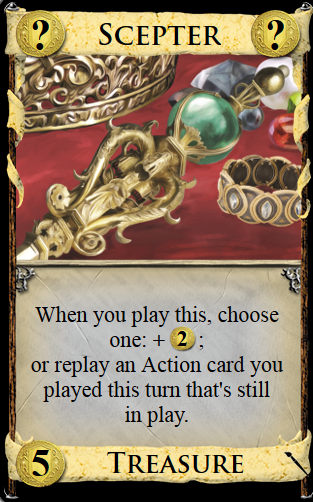 And since Inheritance has the similar problem of adding card types to Estate, those frames were also created. 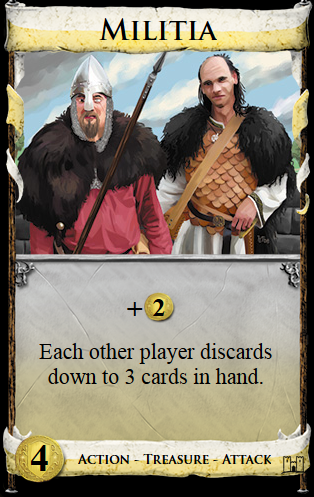 It's worth it to inherit a Caravan Guard just to see the card frame of an Action - Duration - Reaction - Victory card. Capitalism affects all cards, but only on the turn of a player who has bought Capitalism. 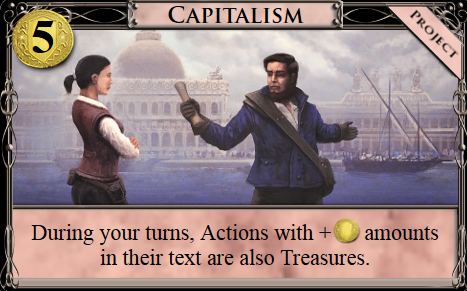 If you've bought Capitalism and your opponent hasn't, your hand cards are 'normal' on opponent's turn and use the updated frames shown above only on your turn (if applicable). Note: The updated card frames will only apply to the full cards (those with picture and text) at the moment, so the supply will (at least for now) always have the unaltered card frames. Remember that cards being Treasures can matter in a few cases for cards not owned by the player who'se turn it is. For example, if your opponent plays Bandit or Pirate Ship when they have Capitalism, the top cards of your deck are also affected if they contain the required text, so might get trashed. While Capitalism combos in old and new ways with many cards (think Bank or Minion) it doesn't combo with Keep. When the game is over and points are counted, it is nobody's turn so Capitalism isn't affecting any cards any more. For this reason, the VP counter will also not count cards turned into Treasures during the game for the Keep points. Right-clicking landscape cards now also shows their autoplay settings (Travelling Fair) and their associated cards, just like for the portrait cards. Right-clicking on Capitalism shows you which cards will be affected by it, for example. First, if you don't want to use that new interface, you don't have to! You can select your Event, Landmark or Project as before from the card list and it will be added below as before. Just as with the portrait cards, there are now slots for the landscape cards (4 at most). You can now select which type(s) of landscapes can appear in any slot. The standard from before is shown above: 2 slots, and each slot can contain an Event, Landmark, Project or it could be empty/unused. If you want to change the options, just click on the picture/checkmark to make the checkmark (dis)appear. 2 slots, and each is guaranteed to be filled with a random Project. That's because there is no checkmark on the empty area, so this slot cannot be left empty, and since only the Project quarter has a checkmark, it has to be a Project. The same can be done with any landscape type or even a combination. If you want more slots, just add them by clicking on the slot with the green plus sign. If you want less (say a game guaranteed to not have any landscapes), just remove all checkmarks from a slot. There are also tooltips available for these slots, if you hover over them with the mouse.